The mission of the Kairos Prison Ministry is to share the transforming love and forgiveness on Jesus Christ to impact the hearts and lives of incarcerated men, women, and youth, as well as their families, to become loving and productive citizens of their communities. The people of Kairos are called by God to share the love of Christ with those impacted by incarceration. Kairos is an ecumenical ministry that encourages Christians from various backgrounds to be volunteers in this Christ-filled ministry. Kairos programs offer to prison residents, their families, and those who work with them, the opportunity to receive God’s forgiveness through faith in Jesus Christ, and to grow in their faith and servant hood through Christian community. Why do we need Kairos prison ministry? Statistics show that the United States has the world’s highest incarceration rate, 724 people per 100,000. Incarceration has become an $80 billion dollar a year industry#. Studies have shown by attending and participating in faith-based activities, such as Kairos, the recidivism rate (inmates that return to prison after getting out) can be dramatically decreased (by 50% or more in one recent study*). The prison administration supports Kairos because it is one of the most effective programs for inmates and does not cost the prison any money since it is staffed by Christian volunteers. 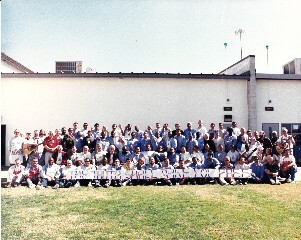 Prisons have seen a noticeable decrease in violence after Kairos 4 day events. Friendship with God is a free gift, for God so loved the world that he gave his one and only Son so that whoever believes in Him shall not perish but have eternal life (John 3:16). The love of Jesus Christ motivates His followers to provide food for the hungry, drink to the thirsty, welcome to the stranger, clothes for the naked, and visits to the sick and those in prison (Matt 25:36).